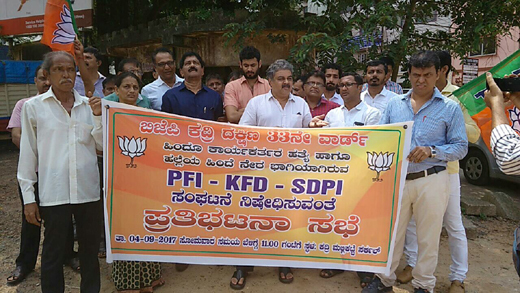 Mangaluru, Sep 04, 2017: DK district unit ofBJP Yuva Morcha,to hold ’Mangaluru chalo’ protest rally on September 07, seeking ban on ’communal organization’ such as the SDPI, PFI and the KFD. The motive of the rally was to protest the killing of its workers in the coastal region and to demand the resignation of district in-charge minister B Ramanath Rai, will be flagged off from five different places and reach Mangaluru on September 7. Congress leaders have urged the BJP not to go ahead with the rally given the communal tension in the region. CM Siddaramaiah has reportedly directed police to crack down against those who trigger communal violence. It is the ruling party’s responsibility to ensure protection for such rallies.Though party workers had applied for police permission in the jurisdictional stations, they haven’t got the sanction as yet. Siddaramaiah is indirectly trying to impose an undeclared emergency on the state.